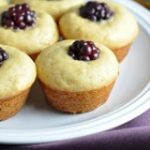 Portable mini pancake muffins made with vanilla almond milk, honey, and blackberries. Perfectly delicious breakfast for on the go! Preheat oven to 350 degrees. Generously coat a mini muffin pan with nonstick spray. In a medium bowl whisk almond milk, honey, melted butter, vanilla, and egg until combined. Add wet ingredients to dry ingredients and stir with a wooden spoon until just combined. Fill 20 muffin wells with batter 3/4 full (about 1 tablespoon.) Place a blackberry on top of each and gently press down. Serve immediately with a sprinkling of powdered sugar, or a drizzle of honey or maple syrup.